Are you looking for the perfect appetizer, snack or meal? Well these Chicken Lettuce Wraps are perfect for any occasion! 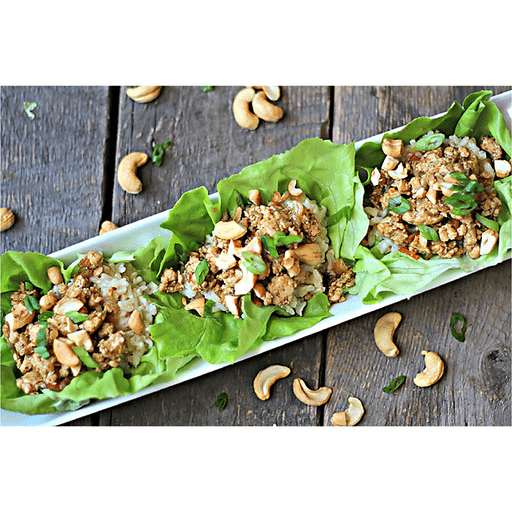 They are packed with rice, crunchy chicken and cabbage, and are topped off with nutty cashews and fresh green onions; all wrapped up in a refreshing lettuce leaf. 1. In a small bowl, whisk together soy sauce, hoisin sauce, vinegar and honey. Set aside. 1. Heat oil in a large skillet over medium-high heat. Add garlic and ginger to pan and sauté 30 seconds. Add coleslaw and chicken and cook until coleslaw wilts and chicken is browned. Add soy sauce mixture and cook another 60 seconds. 1. Divide cooked rice and chicken mixture evenly among lettuce leaves. Sprinkle evenly with green onion and cashews and spoon sauce from pan on to each wrap. Calories 390, Total Fat 12g (Saturated 2.5g, Trans 0g), Cholesterol 55mg, Sodium 450mg, Total Carbohydrate 51g (Dietary Fiber 9g, Sugars 13g), Protein 24g, Vitamin A 330%, Vitamin C 70%, Calcium 20%, Iron 45% *Nutritional values are an approximation. Actual nutritional values may vary due to preparation techniques, variations related to suppliers, regional and seasonal differences, or rounding.